It is not uncommon to observe circulating tumor antigen-specific T lymphocytes in cancer patients despite a lack of significant infiltration and destruction of their tumors. Thus, an important goal for tumor immunotherapy is to identify ways to modulate in vivo anti-tumor immunity to achieve clinical efficacy. We investigate this proposition in a spontaneous mouse tumor model, Rip1-Tag2. Experimental therapies were carried out in two distinctive trial designs, intended to either intervene in the explosive growth of small tumors, or regress bulky end-stage tumors. Rip1-Tag2 mice received a single transfer of splenocytes from Tag-specific, CD4+ T cell receptor transgenic mice, a single sub-lethal radiation, or a combination therapy in which the lymphocyte transfer was preceded by the sub-lethal radiation. Tumor burden, the extent of lymphocyte infiltration into solid tumors and host survival were used to assess the efficacy of these therapeutic approaches. In either intervention or regression, the transfer of Tag-specific T cells alone did not result in significant lymphocyte infiltration into solid tumors, not did it affect tumor growth or host survival. In contrast, the combination therapy resulted in significant reduction in tumor burden, increase in lymphocyte infiltration into solid tumors, and extension of survival. The results indicate that certain types of solid tumors may be intrinsically resistant to infiltration and destruction by tumor-specific T lymphocytes. Our data suggest that such resistance can be disrupted by sub-lethal radiation. The combinatorial approach presented here merits consideration in the design of clinical trials aimed to achieve T cell-mediated anti-tumor immunity. With breakthroughs in molecular biology, basic immunology and biotechnology, great progress has been made in the field of tumor immunology. An increasing number of tumor antigens have been identified . Tumor vaccines have been successful in eliciting tumor-specific CD4+ and/or CD8+ T cell responses. However, when T cells reactive against tumor antigens are expanded ex vivo and then transferred back into tumor-bearing hosts, results have been mixed in treating both melanoma [2–4] and lymphoma [5–7]. Several explanations for these variable results have been suggested by studies of T cell immunity in mice, involving experimental tumors derived from inoculation of cell lines. In some circumstances, CD4+ and CD8+ T cells were rendered inactive in tumor-bearing hosts . The inactivation of CD4+ T cells has been attributed either to the tumor cells themselves or to bone marrow-derived cells [9–11], whereas antigen ignorance or loss of memory have been postulated to underlay that of CD8+ T cells [12, 13]. Other studies have suggested that tumor cells can secrete immunosuppressive factors such as TGF-β or express Fas ligand to induce apoptosis of infiltrating lymphocytes [14–16]. Furthermore, the tumor vasculature appears to be quite different from normal blood vessels, in terms of structural organization, interstitial pressure, and flow patterns , and in reduced lymphocyte and natural killer cell homing and adhesion [18–21]. The existence of significant barriers to effective immunological destruction is further illustrated by a mouse model of concurrent multistage tumorigenesis and anti-oncogene autoimmunity, wherein progenitor dysplastic lesions are infiltrated and disrupted, while solid tumors are not . The hypothesis is that the microenvironment of certain types of solid tumor can serve to locally suppress T cell infiltration. In such cases, one of the challenges for tumor immunology is to find effective means to overcome these barriers to productive efficacious anti-tumor immunity. Herein we sought to modulate anti-tumor immunity in a transgenic mouse tumor model in which an oncogene, SV40 large T antigen (Tag), is expressed in islet beta cells under the control of the rat insulin promoter, Rip1 . Several lines of Rip1-Tag mice have been generated and characterized. Depending on the temporal and spatial order of Tag expression, the Rip1-Tag mice are either immunologically tolerant or responsive to Tag [24, 25]. Mice in the Rip1-Tag2 line begin to express Tag during embryogenesis. The mice show systemic tolerance to Tag, mounting neither humoral nor cellular immune responses to Tag upon immunization of purified protein [25, 26]. Rip1-Tag2 mice display a reproducible pattern of multistage tumor development, from normal islets to hyperplastic/dysplastic islets, to angiogenic islets, to varying grades of solid tumor, with a well-defined angiogenic progression . All Rip1-Tag2 mice succumb to hypoglycemia and tumor burden by 13–16 weeks. Mice with transgenes encoding T cell receptors from H-2k-restricted CD4+ and CD8+ T cell clones specific for Tag have been generated [28, 29]. When Rip1-Tag2 was crossed to TCR transgenic mice (TCR1) carrying Tag-specific CD4+ T cells, temporal induction of T cell tolerance to Tag was detected in the pancreatic draining lymph nodes in the double transgenic mice . The T cell tolerance is manifested in reductions both of idiotypic CD4+ T cell abundance and of the T cell proliferation response to Tag in vitro. Another line of Rip-Tag mice, Rip1-Tag5 has a different spatial and temporal order of Tag expression . Tag expression begins at approximately 10 weeks of age. Several weeks later, a spontaneous autoimmune response to Tag is readily detectable, with significant lymphocyte infiltration of hyperplastic/dysplastic islets. Mice in this line readily mount a humoral and CTL response to Tag, and as such are non-tolerant. Infiltration of premalignant lesions is variable and occasionally intense, but is minimal in solid tumors. Crosses of Rip1-Tag5 mice to transgenic mice that either increased the abundance of anti-Tag CD4+ T cells (TCR1)  or rendered the tumor cells co-stimulatory (Rip-B7-1)  dramatically enhanced the infiltration of premalignant lesions, but not of solid tumors . Additionally, ex vivo stimulated Tag-specific CD4+ T cells were transferred into Rip1-Tag5. Like many of the adoptive transfers of tumor-specific T cells in clinical cases [2–7], no significant lymphocyte infiltration into solid tumor was detected . If, however, Rip1-Tag5 mice were treated with lethal radiation and subsequent reconstitution with bone marrow from RAG1 deficient mice prior to T cell transfer, modest lymphocyte infiltration into solid tumors was noted ; however, this study did not assess the efficacy of that response. Sub-lethal irradiation has been successfully used to decrease tumor burden in combination with a cytokine-producing tumor vaccine in a murine renal cell carcinoma lung metastases model . In the current study, we sought to achieve efficacious anti-tumor immunity by disrupting the evident barriers presented by solid tumors in the Rip-Tag model. We chose the Rip1-Tag2 line, for its phenotype of rapid, largely synchronous tumorigenesis, and its systemic tolerance, reasoning that effects of experimental manipulations could be readily distinguished. Lethal dose radiation followed by bone marrow transplant can significantly impair the responsiveness of anti-tumor CD8+ T cells, dendritic cells, eosinophiles and macrophages , and is a clinically undesirable therapeutic modality. Therefore, we hypothesized that sub-lethal radiation might be more effective and clinically acceptable in promoting anti-tumor immunity. The results presented in this study suggest that sub-lethal radiation is effective in augmenting adoptive anti-tumor immunity in the Rip1-Tag2 model, underscoring the potential value of perturbing the tumor microenvironment as well as the lymphoid compartment to enhance anti-tumor immunity. Rip1-Tag2 mice carry the SV40 early region under control of rat insulin II promoter . The transgenic mice were maintained on C3HeBFe background with 39–40 generations of backcross. Rip1-Tag2 mice have 100% incidence of spontaneous insulinoma. Tag-TCR1 (referred to hereafter as TCR) transgenic mice expressing a T cell receptor transgene with specificity to Tag were generated in the B6D2F1 background and backcrossed to C3HeBFe for 20 generations . About 10% of the splenic CD4+ T cells in this transgenic line express the TCR transgene . All Rip1-Tag2 in all treatment groups received the same diet throughout the experiment. All experimental procedures were conducted in accordance with NIH and University of California, San Francisco guidelines. The Intervention trial was initiated when Rip1-Tag2 mice reached the age of 10 weeks. Mice were sacrificed at 13 weeks of age for the determination of tumor burden. The Regression Trial started at the age of 12.6 weeks (about 88 days after birth). The end point was at 16 weeks of age. In both cases, cohorts of Rip1-Tag2 mice were set up for survival study. Mice were euthanized when they became moribund. Rip1-Tag2 mice at the specifically defined age were irradiated in the Mark I model 68A cesium 137 irradiator (J. L. Shepherd & Associates, San Fernando, CA). The dosage used was 600R (6 Gy). Splenocytes from TCR or non-transgenic C3H mice were isolated. The cells were briefly hemolyzed, washed extensively in DMEM containing 10% FBS, filtered through a 100 μM sterile nylon filter, counted by hemacytometer, and suspended in complete medium. The cells were adjusted to a density of 1 × 108 cells/ml and injected into the intraperitoneal space of Rip1-Tag2 mice. Each mouse in the treatment received 1 ml of splenocytes (1 × 108 cells). In the group that received both radiation and splenocyte transfer, mice were irradiated at 600R one day prior to splenocyte transfer. Rip1-Tag2 mice in each treatment were sacrificed at the defined end points. Solid tumors were isolated, photographed, and measured. The tumor volume was calculated using the following formula: volume = 0.52 × (width)2 × (length). Tumor burden per mouse was defined as the sum of the volume of all macroscopic tumors. Intestinal carcinoid tumors appear occasionally in Rip1-Tag2 mice. Such tumors are associated with this particular line of Rip-Tag transgenic mice (but not others) and were not the result of any of the treatments in the study. Thus, these extra-pancreatic tumors were recorded but not included in the calculations in the current study. All histological analyses were done on frozen sections. Samples were fresh frozen in Tissue-Tek O.C.T. compound (Sakura Finetek, Torrance, CA USA) and sectioned at 10 μM thickness. For immunohistochemistry, sections were briefly fixed in cold acetone. They were then blocked for 1 h in PBS with 5% normal goat serum. Slides were incubated at room temperature for 1 h with the primary antibodies. The samples were washed extensively in PBS and then incubated with biotinylated secondary antibodies (Vector Laboratories, Burlingame, CA). Endogenous peroxidase activity was quenched with 0.6% H2O2/methanol for 4 minutes. Color on sections was developed with ABC-horseradish peroxidase (Vector Laboratories) and 3,3'-diaminobenzidine substrate (Sigma, St. Louis, MO). H&E staining was performed with hamatoxylin Gill #3 and eosin Y (Sigma). The following antibodies were used for immunohistochemistry: anti-murine CD4 (H129.9); anti-murine CD8 (53-6.7); anti-murine CD11c (HL3); anti-murine CD31 (MEC 13.3) at recommended concentrations (PharMingen, San Diego, CA). Tumor burden was analyzed using the Mann-Whitney test (InStat version 1.12, GraphPad Software). Survival data was analyzed with a log-rank test (Prizm 3.0 A, GraphPad software). Intervention trial. Effect of treatment on (A) the mean tumor volume (mm3) +/- standard deviation and (B) mean tumor number +/- standard deviation in 10 week old RIP1-Tag2 mice with small solid tumors for n = 8–11 mice. IT10w stands for initial tumor burden and tumor number. Statistical analysis was done using a two-tailed, unpaired Mann-Whitney test. P values comparing experimental groups to untreated control mice are 0.03 , 0.0004 , and 0.0044 , respectively. P value comparing 600R treated mice to TCR+600R is 0.0055 . In the regression trial, RIP1-Tag2 mice with substantial tumor burden and minimal life expectancy were treated beginning at week 13 . The average tumor volume was around 22 mm3 at the start of the treatment (Figure 2). The tumor burden of the untreated control group at the end of the study was ~146 mm3. No reduction in tumor burden was observed following adoptive transfer of non-transgenic splenocytes alone (132% of controls). In contrast, sub-lethal radiation alone resulted in a significant reduction of tumor burden (63%, p = 0.01). The combinatorial treatment produced an even greater reduction in tumor burden (80%, p = 0.0009). The average tumor number in all groups was similar (about 8). As observed in the intervention trial, tumor burden in the group receiving the combinatorial treatment had remained virtually unchanged. Thus, even with substantial tumor burden, the combination of sub-lethal radiation and splenocyte transfer could stop tumor growth during the course of the study. Regression Trial. Effect of treatment on (A) the mean tumor volume (mm3) +/- standard deviation and (B) mean tumor number +/- standard deviation in 13 week old RIP1-Tag2 mice with large solid tumors for n = 8–11 mice. IT13w stands for initial tumor burden and tumor number. Statistical analysis was done using a two-tailed, unpaired Mann-Whitney test. P values comparing experimental groups to untreated control mice are 0.0149  and 0.0009 , respectively. P value comparing 600R treated mice to TCR+600R is 0.0006 . Because the combination of sub-lethal radiation and TCR splenocyte transfer lead to significant reduction in tumor burden in both intervention and regression trials, we asked whether the radiation had increased the number of tumor-infiltrating lymphocytes. Tissue samples were collected three weeks after treatment in the regression trial. Immunohistochemistry was used to detect CD4+, CD8+ and CD11c+ cell infiltration into the tumors. Because Rip1-Tag2 mice are inherently tolerant to Tag, little infiltration by either T lymphocytes or dendritic cells was observed in the untreated control group (Figure 3). In agreement with previous observations, little infiltration was detected in Rip1-Tag2 mice receiving TCR splenocyte transfer (Figure 3). Nor did radiation alone elicit T cell infiltration, although a modest increase in CD11c+ dendritic cell infiltration was observed. However, in both intervention and regression trials, significant CD4+ T cell and CD8+ T cell infiltration into hyperplastic/dysplastic islets and tumors was noted in Rip1-Tag2 mice that had received the combination of sub-lethal radiation and adoptive transfer of TCR splenocytes. A modest increase in CD11c+ dendritic cell infiltration was observed in the mice receiving the combination therapy. One should recall that the TCR mice express a CD4-restricted TCR, and thus produce increased numbers of anti-Tag CD4 T cells, and thus we anticipated a bias in numbers toward this T cell type. Indeed, one week after treatment, little CD8+ T infiltration of premalignant or malignant lesions was detected in Rip1-Tag2 mice receiving the combinatorial treatment (data not shown). However, three weeks after combinatorial treatment in the regression trial, significant CD8+ T cell infiltration was observed in solid tumors, suggesting a broadening of the T cell response from that contained in the adoptive transfer. Adoptive transfer of Tag-specific TCR splenocytes following sub-lethal irradiation results in T cell infiltration of solid tumors. Representative frozen sections of tumors from 16 week old Rip1-Tag2 pancreas were analyzed by immunohistochemistry for CD4, CD8 and CD11c. The transgenic mice were treated as follows: (A-C) untreated, (D-F) TCR splenocytes, (G-I) 600R, and (J-L) 600R + TCR splenocytes. Extensive CD4+ T cell infiltration (A, D, G, J) is observed only in mice receiving both sub-lethal irradiation and adoptively transferred TCR splenocytes (J). When analyzed for infiltration by CD8+ T cells (B, E, H, K), again only tumors from mice treated with the combination therapy showed significant infiltration (K). 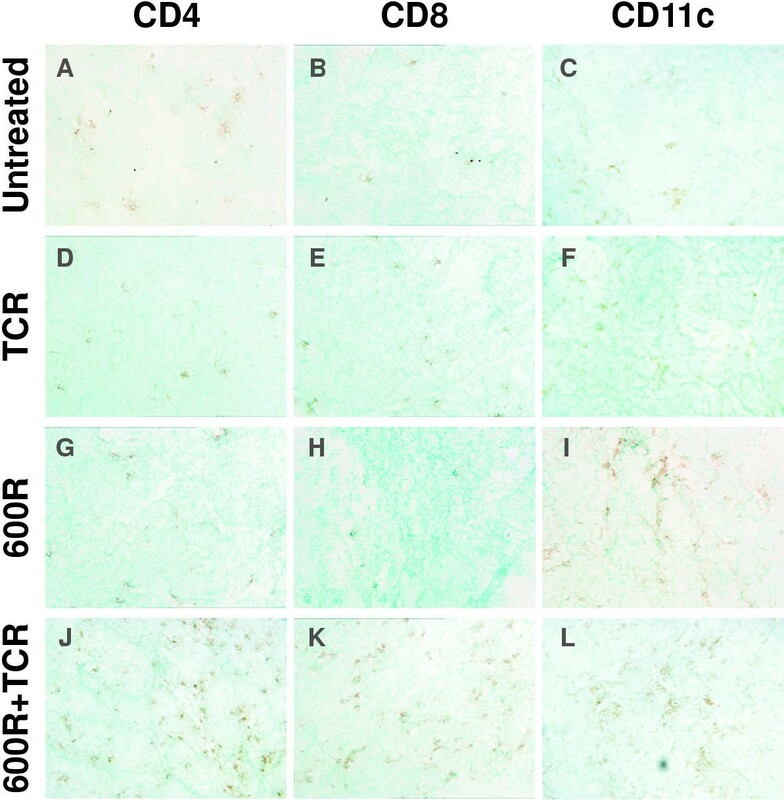 Dendritic cells, as detected by the antibody to CD11c (C, F, I, L), were observed in all tumors, but mice receiving both 600R (I) and the combination therapy have a greater degree of CD11c+ cell infiltrate (L). The trials above used defined endpoints (12.6 week and 16 week) to allow comparison of cumulative tumor volume and number. To evaluate the effects of the various treatments on survival, we performed intervention and regression trials on cohorts of Rip1-Tag2 mice, in which groups received no treatment, radiation alone, or the combinatorial treatment, in which the endpoint was survival. Because splenocyte transfer alone had resulted in no significant reduction in tumor burden, this group was not tested for survival benefit, for logistical reasons. All Rip1-Tag2 mice in the study eventually succumbed to their cancers. Although radiation treatment alone impaired tumor growth in both intervention and regression trials, it produced no significant extension of survival time in either trial (Figure 4). In contrast, there was a significant extension of survival of cohorts receiving the combinatorial treatment in the intervention and regression trials. The effect was pronounced in the intervention trial, with an extension of survival of 5 weeks (p < 0.0001, log-rank). In the regression trial the extension of survival time was about 3 weeks (p = 0.001, log-rank). No extension of survival time was observed in mice treated with 600R and syngeneic C3H splenocytes (p = 0.6893, log-rank). 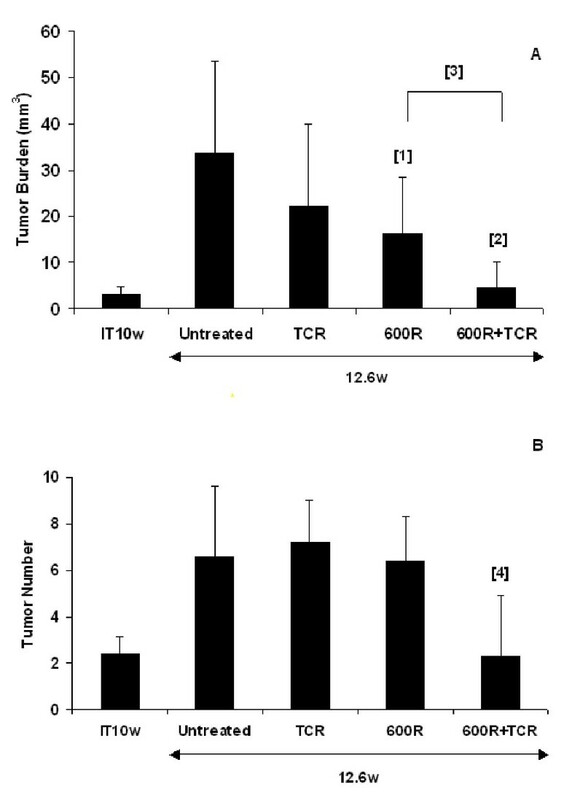 Thus, the observed reduction of tumor burden produced by the combinatorial treatment translated into significant survival advantage, and the effect was dependent on the increased frequency of tumor-antigen specific T cells from the TCR transgenic. Combinatorial therapy prolongs survival in RIP1-Tag2 mice. 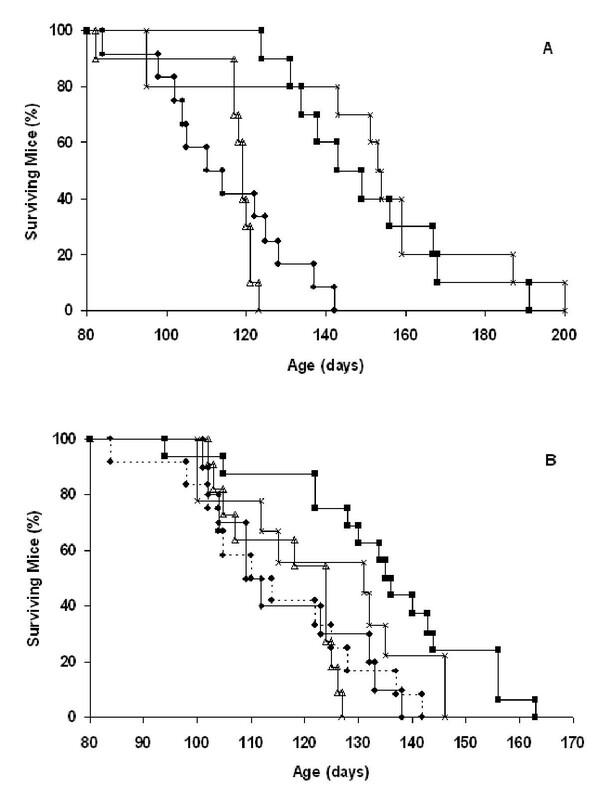 Effect of treatment on survival in (A) 10 week old (intervention) and (B) 13 week old (regression) RIP1-Tag2 mice. Between 10–12 mice were tested in each cohort. In the intervention trial (A), cohorts were treated with: untreated (closed circles, n = 12), 600R (open triangles, n = 10), TCR splenocytes + 600R (closed squares, n = 10) and TCR splenocytes + 600R (x2) (x, n = 10) and allowed to age until they became moribund. Statistical analysis was done using a log-rank test. P values comparing experimental groups to untreated control mice are TCR+600R (<0.0001) and TCR+600R(x2) (0.0003). In the regression trial (B), cohorts were treated as above with an additional control group C3H splenocytes + 600R (closed diamonds, n = 10) and allowed to age until they became moribund. The sample sizes are: untreated control, n = 12; 600R alone, n = 11; TCR splenocytes + 600R, n= 16; TCR splenocytes + 600R (x2), n = 9. 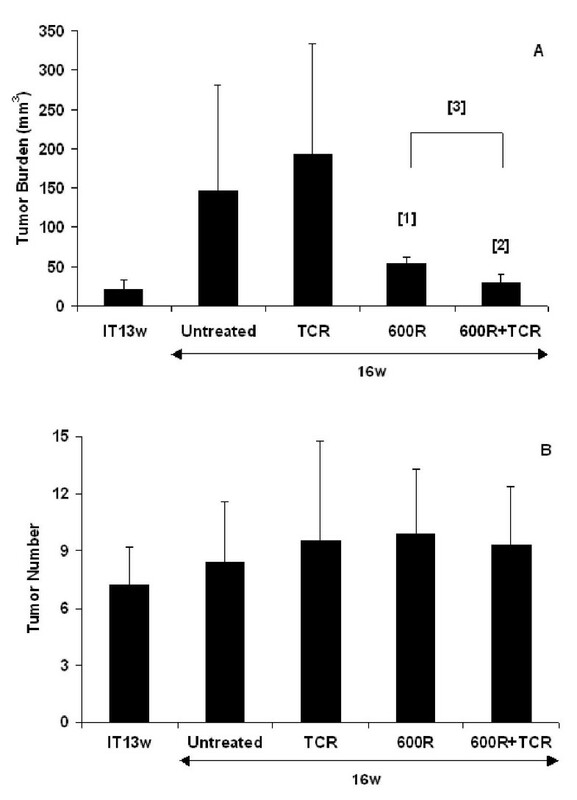 P values comparing experimental groups to untreated control mice are TCR+600R (0.001) and TCR+600R(x2) (0.0715). Because the single combination treatment lead to clear therapeutic benefits and yet did not eradicate established tumors, we asked whether mice would benefit from repeated treatments. Both intervention and regression trials were conducted. Rip1-Tag2 mice were given the combination treatment at 10-weeks and again at 13-weeks of age for an intervention trial, or at 13 and 16-weeks for a regression trial. Survival was monitored over time. The results show no added survival benefit when the treatment regimen was repeated (Figure 4). The mean survival time was statistically equivalent to that observed in the groups given a single combinatorial treatment in the intervention trial, and in the regression trial the cohort given a double combinatorial treatment showed no significant extension of survival time as compared to untreated controls (p = 0.07, log-rank). Previous studies using lethal dose radiation and bone marrow transplant prior to CD4+ T cell transfer in another Rip-Tag line of mice indicated that such treatment could produce a modest increase in the number of tumor-infiltrating T cells . The current study extends the thesis by focusing on the use of sub-lethal radiation to enhance the anti-tumor immunity of adoptively transferred tumor-antigen-specific lymphocytes in Rip1-Tag2 mice. The splenocytes were derived from T cell receptor transgenic mice that preferentially enhanced development of CD4+ T cells recognizing a peptide within the SV40 large T oncoprotein . While the transfer of naive splenocytes from the TCR transgenic mice had no effect on tumor development, sub-lethal radiation prior to lymphocyte transfer resulted in significant reduction in tumor burden in both intervention and regression trials. In addition, Rip1-Tag2 mice receiving the combinatorial treatment had significantly longer survival time than those receiving single treatment. Immunohistochemical analysis indicates that the combinatorial treatment dramatically increased the level of infiltration by CD4+ lymphocytes and CD11c+ dendritic cells into solid tumors. Due to the nature of this line of TCR transgenic mice, only about 10% of splenic CD4+ T cells are Tag-specific. Thus, it is possible that some of the tumor-infiltrating, CD4+ T cells may recognize targets other than Tag. This may be the result of the "bystander" effects induced by the tumor-infiltrating, Tag-specific, CD4+ T cells. The elucidation of this phenomenon with idiotype-specific antibodies or tetramers in future experiments would clarify the extent of "bystander" effects in this model. Although delayed when compared to CD4+ T cell infiltration, CD8+ T cell infiltration became more extensive over time. We speculate that the tumor-infiltrating, CD4+ T cells would induce the activation and tumor-infiltration of CD8+ T cells present in the transferred transgenic splenocytes. This pattern, as well as the origin of the splenocytes, suggests that CD4+ T cells can play a predominant and effective role in controlling tumor growth. Previous studies have indicated that solid tumors can be resistant to the infiltration of tumor-specific T cells. The data presented here suggest that such resistance can be disrupted by sub-lethal radiation. Several possible mechanisms for the enhancing effects of sub-lethal radiation on anti-tumor immunity can be envisioned, as discussed below. First, sub-lethal radiation may reduce antigen-specific immune tolerance mediated by bone marrow-derived cells, including regulatory T cells, in the tumor-draining lymph nodes. Previous studies have shown that adoptively transferred tumor antigen-specific CD4+ T cells can be tolerized in the secondary lymphoid organs [9, 34], including the RIP-Tag2 model . Radiation may kill or disable regulatory T cells [35, 36], or other bone marrow-derived tolerizing cells and prevent the induction of tolerance in adoptively transferred tumor-specific T cells . Additionally, the high but sub-lethal dose of radiation used leads to significant lymphopenia . The sudden reduction in lymphocyte number may create the spatial allowance in spleen and lymph nodes necessary for the homing, activation and expansion of he adoptively-transferred T cells. The increase of tumor-specific CD4+ T cells in the tumor-draining lymph nodes could then enhance the infiltration of T cells inside the solid tumors. Second, radiation-induced damage or abnormality may induce a "tissue damage signal" in the solid tumors through radiation-mediated apoptosis . There is mounting evidence that apoptotic cell death is not immunologically benign, but can trigger immune responses [39, 40]. For example, cells treated with ultraviolet radiation can provide potent adjuvant function in vivo . Sub-lethal radiation could result in altered expression of pro or anti-inflammatory chemokines [42–44] or increased expression of T cell co-stimlulatory molecules (i.e. B7-1) on tumor cells . Radiation has been shown to increase the expression of MHC class I and II molecules in tumor cell lines [46, 47]. Thus, the tissue damage signals evoked by ionizing radiation may trigger the activation and infiltration of antigen-presenting cells, in particular dendritic cells [38, 48–50]. Indeed, in the regression study, we observe some increase of tumor-infiltrating dendritic cells in the group receiving the single radiation treatment. It is possible that radiation-induced, tumor-infiltrating dendritic cells may facilitate sustained activation and infiltration of the adoptively transferred CD4+ T cells in solid tumors in the combination group. Third, radiation may alter the biophysical structures of tumors, which in some tumors has the capability to impair the infiltration or function of tumor-specific T cells. For example, in the related Rip1-Tag5 model, the vascular addressins GlyCAM-1 and MAdCAM-1 are expressed in pre-malignant islets, but down-regulated in solid tumors; their downregulation coincides with lack of infiltration in this model of spontaneous anti-tumor immunity . It is possible that sub-lethal radiation is altering the expression of endothelial adhesion molecules allowing binding and extravasation of activated tumor-specific lymphocytes. Another study suggested that liver endothelial cells can induce antigen-specific tolerance of CD8+ T cells . Perhaps RIP-Tag tumor endothelium develops a similar capability to induce tolerance to extravasating CD4+ T cells, a capability disrupted by radiation. Finally, it is worth noting that the tumors in Rip1-Tag2 mice are not only highly vascularized, but also visibly and histologically hemorraghic. The hemorraghic phenotype persisted in all single agent trials, but the combination trial was distinct. The mice in the combination treatment group typically had "white" tumors that lacked visible microhemorrhaging. A recent study has suggested that tumor-specific, CD4+ T cells can exert anti-tumor effects by inhibiting angiogenesis via release of IFN-γ . Thus, the "white" tumors noted in the current study may be indicative of angiogenic inhibition by the infiltrating tumor-specific, CD4+ T cells, and such inhibition may be relevant to the observed efficacy. An analysis of the tumor vasculature in the combination trial by immunohistochemical staining for the endothelial cell marker CD31 revealed no obvious structural or density changes in tumor blood vessels (data not shown). Future analysis of molecular markers of the tumor vasculature during and after the combinatorial treatment will explore the possibility that more subtle vascular changes are responsible for the observed efficacy. While the underlying mechanisms remain unknown, it is evident that a combination of sub-lethal radiation and the transfer of tumor-specific CD4+ lymphocytes can have a synergistic effect on tumor regression. While the anti-tumor effect of the combinatorial treatment does not completely resolve tumor burden and the mice eventually succumb, it is important to recognize that the Rip1-Tag2 mice are a very stringent system for assaying immunotherapies because of the multifocal nature of tumor progression in these mice. Because the Tag oncogene is expressed in all of the ~500,000 pancreatic β cells, each of ~400 islets can be considered an independent pre-malignant focus. Hence, the immunotherapy tested herein would have to destroy all neoplastic foci to affect a complete cure, which is perhaps too much to expect; our view is that the stringency of this system has advantages as a readout for therapeutic strategies, in the observed efficacy may be more predictive of responses in the clinic that those observed with subcutaneous tumors. We expect that clarification of the underlying mechanism may provide avenues to improved therapeutic strategies based on the concept of disrupting the evident barriers to effective anti-tumor immunity erected by solid tumors. We suggest that the combinatorial approach presented here merits consideration in the design of clinical trials aimed to achieve T cell-mediated anti-tumor immunity. Zhu Alexander Cao, Dylan Daniel contributed equally to this work. We are grateful to N. Killeen, L. Lanier, and J. Bluestone for comments on the manuscript. This work was supported by grants from the National Cancer Institute and a training grant from the G.W. Hooper Foundation (to D.H.).